Find artworks, auction results, sale prices and pictures of Sam Mclaren at auctions worldwide. 28 by 46cm., 11 by 18in. Narrow Water Castle is at the strategic narrowson the approach to Newry in Carlingford Lough. 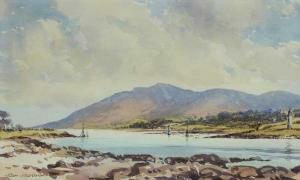 This scene is of theview from Narrow Water towards Carlingford and SlieveFoy.